I love playfulcooking‘s recipes! 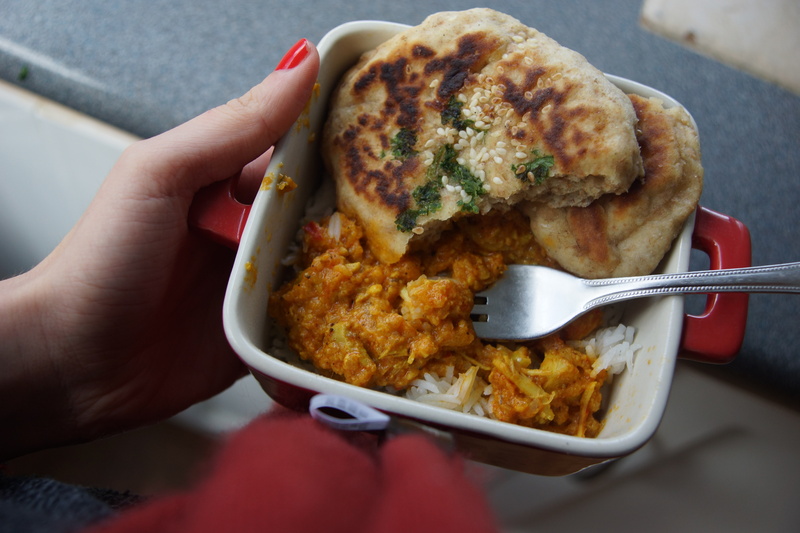 I have been wanting to try a from-scratch curry for some time (especially with this cold winter weather!). I used this recipe with a couple of adaptations. This dish needs a bit of preparation (I wasn’t prepared enough!). Kankana‘s recipe suggests an overnight marinade (or at least 5 hours). I also used her naan recipe. Mine tasted amazing but looked less like naan bread than I hoped. 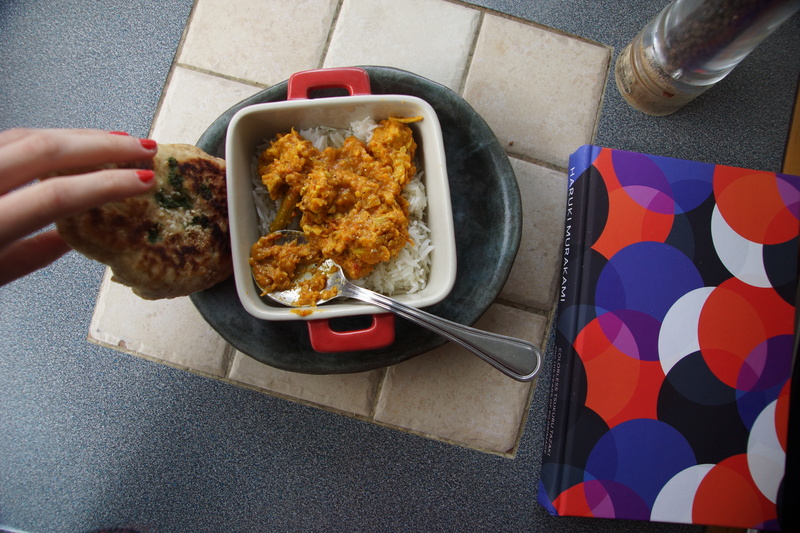 This curry was delicious paired with a few chapters of Haruki Murakami. No better way to spend a cold wintery day! In a food processor/blender – puree onion, cilantro, green chillis, chilli sauce. Add two tablespoons of yoghurt to this and mix. Keep aside. Blend cashews, peanuts, almonds, + a small dash of oil (I’m talking about a teaspoon), and a small squeeze of lemon juice (just for softening). Blend to a fine-ish paste. Keep aside with a mixed-in tablespoon of yoghurt. With a mortar + pestle, grind your coriander seeds and cumin seeds. If you don’t have cumin seeds, use an equivalent amount of cumin powder. Keep this aside also. In a relatively deep pan, add cooking oil and bring to heat. Add cardamom pods and allow for them to release flavour (a few seconds at a good heat.) Add onion puree, a pinch of salt, and cook at a medium high heat for about 4 minutes. Keep in mind that to prevent curdling of the yoghurt, a very high heat must not be used. Kankana’s recipe suggests a medium heat all the way through cooking. Add marinated chicken and cook until the meat is partially cooked through. Then add the cumin and coriander powder that we kept aside earlier, along with peri-peri sauce and pepper. Cook for a few more minutes. Pour the yoghurt and nut blend into the pan, mixing it in. Cook on a medium heat until the oil starts to seperate. If the consistency is too sticky, add more water. Cook for several more minutes until chicken is nearly cooked through. Gradually stir in the tomato and any remaining ingredients. Add more water if too thick. Cook for a couple more minutes and check for salt. Once the chicken is cooked through, remove from heat. Garnish with parsley and serve with rice and naan! sesame seeds + cilantro (I used parsley) this is optional! Sift flour + baking soda + salt + mix! Form a well in the centre, pour oil and yoghurt, start combining together. Too dry? – add a little water. As you knead the dough, you may have to add more water, or if it’s too sticky – more flour. Once ready, cover with a kitchen towel, rest for fifteen mins. Roll into a log, cut 8-9 equal sized discs. As you begin rolling the discs with a rolling pin, make sure you cover the rest of the dough with a kitchen towel or else will lose moisture. While rolling the naan, don’t press too hard. Dust flour and sprinkle a pinch of sesame seeds and your choice of herb, pressing gently with your hands so they stick. Turn the disc over, and brush water on the other side. Place a flat pan on medium heat and keep a lid ready that is the right size! Once the pan is hot enough, place the wet side of flat bread on the pan, covering immediately with your lid. Once the bread starts puffing up, give it about half a minute or longer – then carefully open the lid. Drizzle cooking oil on top, turn the flat bread. Give it about half a second on this side as well. 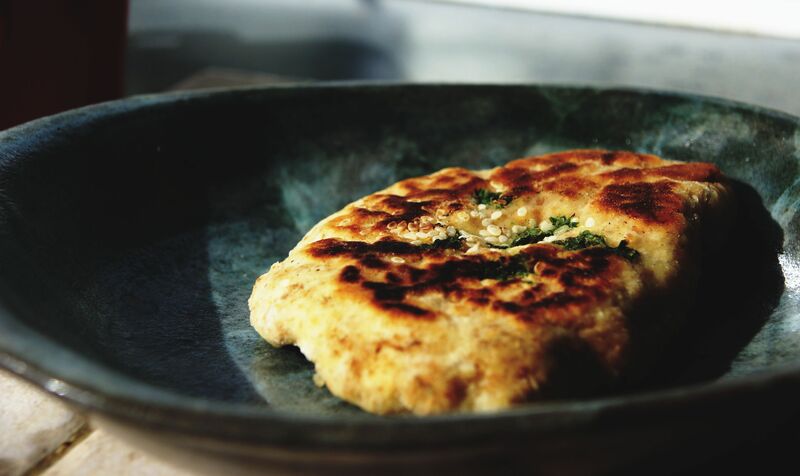 Once done, place the naan breads on a plate and cover with foil. 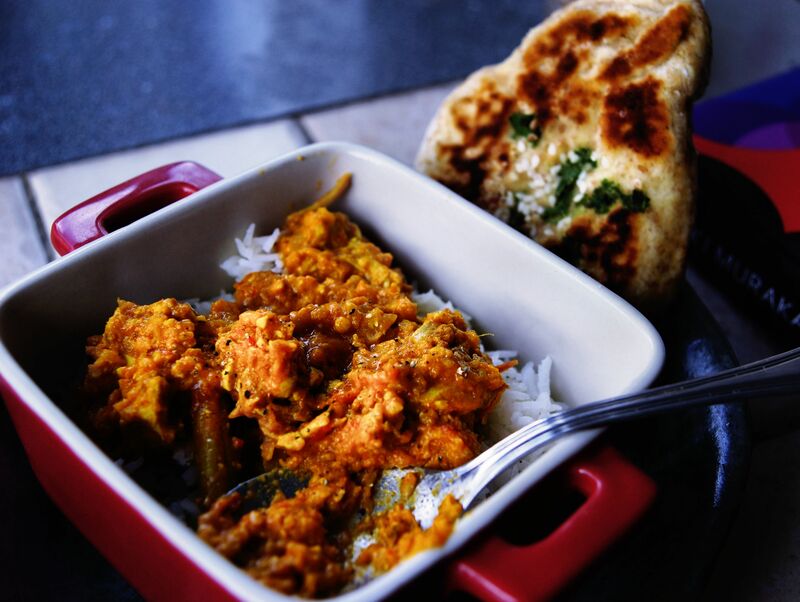 Serve hot with your delicious chicken korma curry!